The OCZ ZX850W power supply is another excellent component from a top notch manufacturer whom is no stranger to the enthusiast PC market. With a full range of high quality power supplies, solid state hard drives, and flash media OCZ is an accomplished provider of computer components. With the speed increases every year computer components require a stable and adequate supply of electrical power to function properly. A cheap or poorly engineered power supply will case components to suffer, perform below expectations, and meet an early demise. The importance of power supply choice is often a low priority or completely overlooked by many builders. Lucky for us today’s item up on the review block is an excellent specimen of power supply engineering, the ZX Series 850W ATX v2.2 power supply unit. This 80+ Gold certified power supply provides high power efficiency of 87%+ at any load between 20% and 100%. This translates to saving you money on your electrical bill, reducing heat in your computer’s system, and prolonging the life of the unit and the components connected to the PSU. This PSU is part of OCZ’s Maximum Performance line-up of power supplies which are available in 850W, 1000W, and a whopping 1200W variant. All units feature 80+ Gold certification, are multi-VGA ready, fully modular cabling, and a single +12V rail design. All power supplies in this line are backed by OCZ’s OCZ’s exclusive 5 year PowerSwap warranty replacement program ensuring a smooth replacement if your unit were ever to fail. 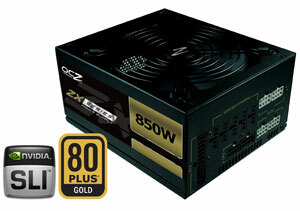 .Join us as we break down the power house OCZ ZX850W power supply.